Last week I decided to wear one of the tops from my first stitch fix, and had originally paired it with white jeans which looked really nice. With the temperatures getting into the upper 80’s I wanted to wear something a little cooler on the bottom than a pair of white jean capris, so I dug this skirt out of my closet. I paired it with one of my favorite necklaces from Kate Spade It is a bunch of symbols designed to look like a curse word, aptly named “Pardon my French” (you can see it up close here on Polyvore). I also grabbed my favorite Franco Sarto sandals and I was ready to go. 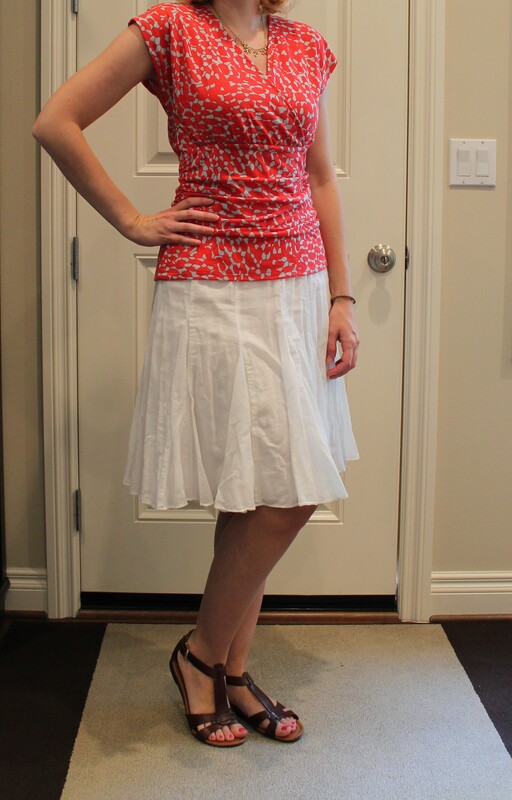 I really love this red top, it was a great find from my first stitch fix.